As the world recently celebrated World Down Syndrome Day, many people with Down syndrome were celebrated and acknowledged for their strength and beauty. And looking back over the years, it seems society is finally starting to turn the corner in terms of accepting those with Down syndrome as valuable and worthy of life, just like any other human being. … their baby is just like everyone else! The stigma against babies with Down syndrome runs deep, with many doctors even encouraging women to abort their babies if they are diagnosed with having special needs. And tragically some countries even post about how they abort babies with Down syndrome. But the trend is starting to turn with more and more individuals with Down syndrome selected for modeling gigs! Who could forget the story of sweet Asher who was selected as the toddler model for OshKosh B’gosh. Because he had Down syndrome, many companies turned him away stating they didn’t want a child with special needs representing their line. But his mom persisted, realizing the worth of her precious son. And then there was Gerber who continued the trend by selecting a baby with Down syndrome to be the national face on the their baby food jars! 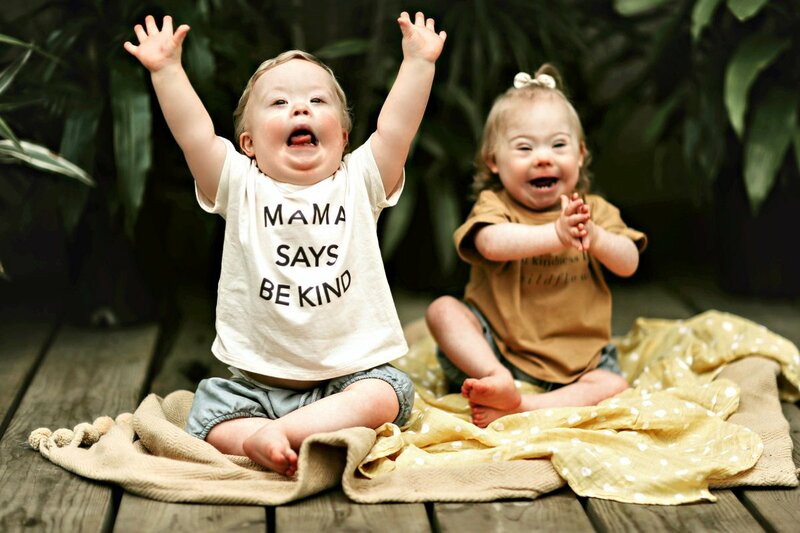 These victories propelled children with Down syndrome to the spotlight, by recognizing what most people feel all along – children with Down syndrome are just as valuable as any other baby, and they are just as beautiful! With all these victories, many still attempt to shame those parents who choose to move forward with having a child with Down syndrome. “And then there are the knife-to-the-heart type of comments: “Didn’t you have the tests?” or “Thank God my screenings came back fine.” Would having a child like mine be so awful? Why do you shamefully assume that if I did have those prenatal screenings I’d have terminated my pregnancy? Add that to the number of times I hear words like “retard,” “spastic” and “special needs” used in casual banter to describe a lack of intelligence (of someone who is otherwise fully abled), and I am left hollow. I constantly face an internal battle of how to formulate the right response. No mother should have to defend her choice to have her baby! And the heartless comments from some still show how far we need to go. But realizing that many just don’t know what to say, this mother went on to share how she wishes people would understand that a mother’s love for her children transcends any disability. So if you’re looking for the right words to say to someone raising a child with special needs, she has some tips. Do you know anyone raising a child with special needs? Why do you think some in society still refuse to value their lives?